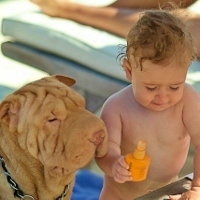 The shar-pei is the ultimate family dog. Shar-Pei are such incredible dogs that it is easy to collect them. They have a bond with their human family that is unlike other dogs. They are very smart, very clean and great with children of all ages. They are addictive once you have had a good one. The AKC breed standard describes the correct qualities in a show dog and lists the major faults and the disqualifying faults. "My "kids" adore Sebastian..he sits on them,kisses them and they run into his crib in the morning as he greets them with "Hi"!"